Sun., Jan. 25, 2009, 9:05 a.m.
•Ryan Fruit & Produce Co. warehouse, 20 E. Riverside Ave. Built in 1928 and enlarged in 1948, the structure was later known as the home of Pacific Fruit and Produce. In the early 1990s it housed Spokane MarketPlace. •Piggly Wiggly warehouse, 28 to 44 E. Riverside Ave.
•Auto Freight Depot of Spokane, 102 E. Main Ave.
Spokane officials have submitted an application for the $15 million extension of Riverside Avenue in time to win approval before new environmental regulations take effect that would prohibit the project. Last month, the Spokane City Council approved extensive changes to the city’s shoreline rules aimed at protecting wildlife habitat along the Spokane River and Latah Creek. Separately, the council signed off on a new route for Riverside Avenue that will extend the street east of downtown to connect to Trent Avenue. Supporters of the extension say the route is needed to divert through traffic from the growing Riverpoint campus, which is run by Washington State University – a change that would make the area more pedestrian friendly and give it more of an urban campus atmosphere. But the route gets as close as 75 feet from the Spokane River. New shoreline regulations approved by the City Council would prevent construction of the street within 90 feet of that portion of the waterway. The new shoreline rules, however, won’t take effect until the state Department of Ecology signs off on the city’s plan, which is likely later this year. City engineers submitted an application for the project this week. The timing will allow the project to proceed under existing regulations, which don’t require a buffer between a new street and the shore. The project still must obtain a shoreline permit, which will be considered by the city’s Hearing Examiner and the state Department of Ecology. “It’s a pretty big difference in the regulations,” said Jo Anne Wright, the city planner who led the process to create new shoreline rules. Spokane Public Works Director Dave Mandyke said the timetable for finishing plans on the route was not affected by changes in shoreline regulations. He noted that city engineers have worked on the concept for years. Although the project likely will not be governed by the new shoreline rules, Spokane Councilman Bob Apple said it’s hypocritical for the city to move forward on a plan that violates new standards that others will have to live by. “We can’t enforce something that we broke,” Apple said. In an interview earlier this month, Mayor Mary Verner said she was not aware that the project wouldn’t meet new standards. “It certainly would make us have to be more careful in our design of that project,” she said. Verner added that the extension is important to the future of the city’s University District. The project will provide a “brand new, newly designed, newly built segment of street in the city of Spokane to demonstrate what a real complete street can actually look like,” she said. The extension would be a two-lane road with a median set aside for a future light-rail system. In the portion that gets closest to the river, there’s little flexibility to move the street because the project is sandwiched between the river and BNSF Railway lines. The project will be funded mostly with federal money. While the route would violate the new environmental rules, the affected area isn’t prime wildlife habitat. Much of the land is stripped bare all the way to the shoreline. The city would plant native landscaping with the goal of improving the habitat for birds, if the project is approved. 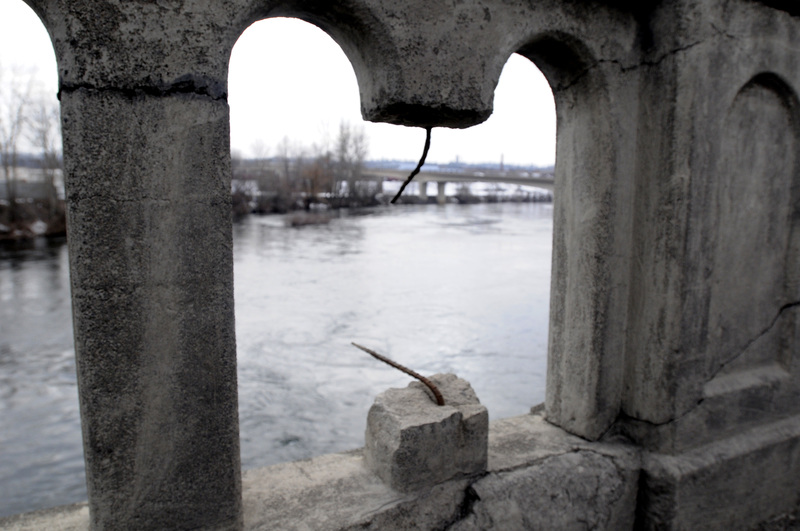 The City Council’s approval of the extension concept came just five years after the state finished rebuilding one of the two Trent Avenue bridges that cross the Spokane River. The state recently gave up the portion of Trent between Hamilton and Division, including the new bridge, to the city. That section of road has been renamed Spokane Falls Boulevard. Washington Department of Transportation spokesman Al Gilson said the state has no plans to relinquish the portion of Trent that includes the bridge east of Hamilton. That’s because the section, labeled state Highway 290, provides a crucial link for truck traffic to get from Trent to Interstate 90 via the Hamilton Street bridge, he said. The old Trent bridge was built in 1910 and remains on a state list for replacement in 2019. Money for the project is expected to come from the 9 1/2 cent gas tax approved by voters in 2005, Gilson said. Although the Trent bridges are expected to have less traffic, officials say the road will remain open and continue to be a link to downtown. “I can assure you we did not waste any money replacing the Trent bridge,” Gilson said. WSU-Spokane spokeswoman Barb Chamberlain said the project – especially the first phase, which connects Riverside to Spokane Falls just west of the new bridge – is essential to improving pedestrian safety on campus. Besides diverting trucks from campus, it is expected to improve the pedestrian link to campus from downtown through an improved intersection at Division Street and Riverside. More than 4,000 students from WSU and Eastern Washington University attended classes on the Riverpoint campus in the fall. Another potential challenge for the extension is that three warehouses potentially eligible for the National Register of Historic Places stand in the project’s way. Two of the buildings, including the former Pacific Fruit & Produce Co. warehouse, are owned by WSU. Spokane resident Christopher Kelly, who attended a recent meeting about the extension, said he hopes the route can be shifted to save the buildings. The campus could more easily achieve an urban, pedestrian-friendly atmosphere by maintaining buildings at its southern edge as opposed to a “retaining wall” next to railroad tracks, Kelly said. But Chamberlain said the structures are in poor shape and that the route was chosen to allow for light rail. “We really think it’s important for us to have all kinds of mass transportation available to the students and the faculty and the staff,” she said. Published: Jan. 25, 2009, 9:05 a.m.